This is a product that comes in the form of a bar of soap. 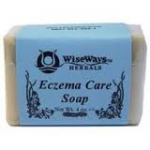 Most of the really competitive and highly rated treatments for eczema and other skin rashes and conditions come in the form of a lotion or a cream that you can rub on, but these types of products have been shown to be somewhat effective at, at least relieving some pain that occurs. The issue with this one though is that if you want something that will feel smooth on your skin when you bathe then this is for you. 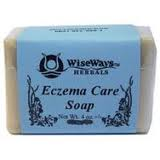 However if you want a skin care product that actually MAKES your skin smoother, then you should look elsewehere. Ingredients present in this soap include: Saponified olive oil, palm, coconut soy ecowax and essential hemp oils, neem, birch, chamomile, palmarosa and lavender. Honestly this bar of soap is pretty great, but that’s all it is, a bar of soap. The soap will not help cure or get rid of any of the bad symptoms you feel especially since it doesn’t have any clinically recommended medicines in it, just natural extracts. This is great for people that like to use all natural and organic products, but for people with serious skin problems, it may feel nice while you bathe, but will not make you feel better outside of the shower. Go somewhere else for the relief you really desire.